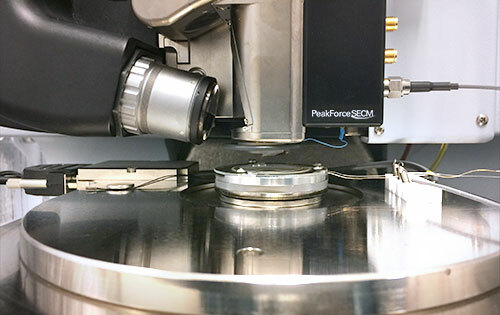 PeakForce SECM (Scanning Electrochemical Microscopy) is a new mode for Bruker AFM (Atomic Force Microscopes). Capture electrochemical data correlated with nanomechanical information, for insights into the relationship between the size, geometry, modulus, adhesion and activity of nanostructured materials. The new mode is available now on Bruker Dimension Icon AFMs. PeakForce SECM features a unique probe design for unmatched precision and control of tip-sample interaction and nano-electrode tip position. Simultaneously capture topographical, electrochemical, electrical and mechanical maps at nanoscale resolution. This reveals a whole range of previously unobtainable information, visualising electrical and chemical processes in liquid. For example, you can observe redox reactions and their kinetics at the nanoscale for the first time. (C) Line profiles of the topographic and EC variations from a nanoelectrode array sample. Nanomesh electrode sample courtesy of C. Stelling and M. Retsch, University of Bayreuth. Image courtesy of A. Mark and S. Gödrich, University of Bayreuth. Nanoelectrode array sample courtesy of M. Nellist and Prof. S. Boettcher, University of Oregon. Our customers have been consistently imaging at very high resolution with the new nanoelectrodes on the Dimension Icon AFM. For the first time they are able to capture electrochemistry correlated with nanomechanical information to understand the complex relationship between size, geometry, modulus, adhesion and activity of nanostructured materials. PeakForce SECM radically redefines what is possible in the nanoscale visualisation of electrical and chemical processes in liquid. This breakthrough is the result of the continuing evolution of PeakForce Tapping technology combined with our in-house design and manufacture of reliable commercial probes. courtesy of J. Jiang, Caltech. Bruker PeakForce SECM probes are batch fabricated using proprietary methods for consistently high quality nano-electrodes. An optimised conductive path and special coating techniques eliminate pinholes, for negligible leakage and capacitive currents. PeakForce SECM improves resolving power over traditional approaches by orders of magnitude, and opens the door to electrochemical measurements on individual nanoparticles, nanophases and nanopores.